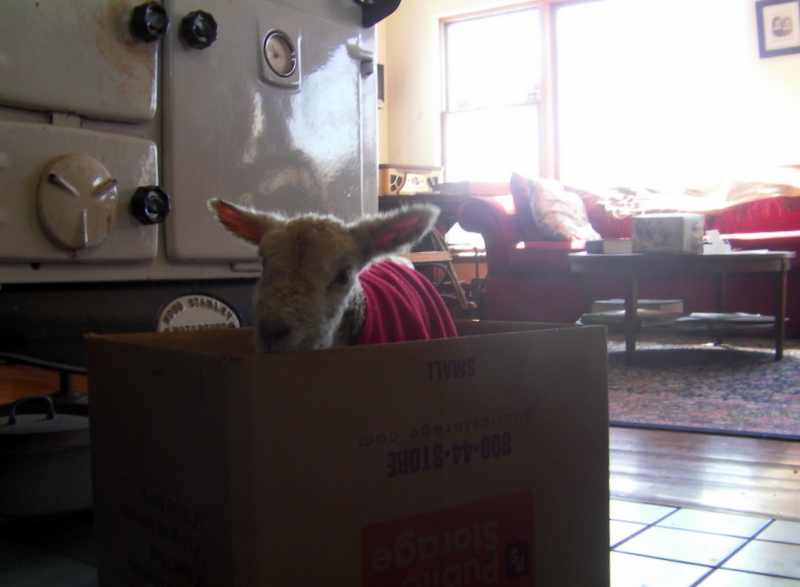 On Monday morning I went to the barn and found a lamb without a mother. It was still wet from the birth and walked around the barn crying for milk. Usually the mother doesn’t leave her baby’s side for the first day or two. I should have found her there licking her lamb, and watching me warily, stamping her feet at me if I got too close. We don’t have many neglected lambs after all these years and I’m wondering with concern which ewe it might be. I stood in the shadows for quite a while, waiting to see which ewe showed any interest. Luckily, the lamb was a big strong single. In the end I had to bring her in the kitchen and all week have given her a bottle with colostrum powder and probiotics added. Yesterday she was not feeling well at all. After she drank her milk she was practically moaning and I could hear her belly making strange sounds and her nose was wet. We gave her a shot of penicillin to fight infection (another rare occurrence here) and a few hours later she was up, drinking, and back to her old self. So far so good. Fingers are crossed here. After her piano lesson I picked Elisa up at the library and found her reading a book in the back corner. She was embarrassed to show me that she was reading The Boys’ Book: How to be the Best at Everything and wanted to know if it would be okay to check it out but could I check it out for her so no one would know she was reading it? She didn’t think it was fair that the girls’ version had chapters about how to paint your finger nails and (Billy’s favorite) how to be a celebrity which involves having your father acting as a chauffeur by holding doors open. The boys’ book tells how to teach a parakeet to talk and how to hypnotize a chicken which Elisa has now been able to do repeatedly to her favorite chicks, and how to get an egg into a bottle. All much more interesting and useful, according to my girls. (sad sigh) This is an old story and it is getting even older lately. In the past week while driving to town, twice I have seen a Pileated Woodpecker in the woods along the side of the road. I believe it is a female . Very exciting. Amazing (and puzzling) about your lamb! So VERY maddening about The Boys’ Book vs The Girls’ Book. p.s. I hope your family is all well by now. Still laughing about your book organization project. Please keep us updated on the lamb’s progress. We are rooting for it to thrive! I’m upset about that Girls’ book–perhaps Elisa could write the author (privately). In the meantime, encourage the librarian to assign the Boys’ Book to children of all sexes. Barry was very interested in the woodpecker. Here we went to the zoo over the holiday weekend and saw one tiger and five lions, but that’s the extent of wildlife, except for the occasional deer by the side of the road. Billy reports that lamb is well and I found someone in Maryland who wants a bottle fed lamb to have as a pet so her future is looking bright. Girls and I are still visiting family in Md for a few days and enjoying the warmth and sun. Billy says that it is snowing on the farm.